I have used many many wipes even though I don't wear a whole lot of makeup and these wipes have been by far the best I have ever used. They are wet and soothing and remove every bit of tinted moisturizer or makeup you wear. Not only was the product amazing though. The packaging and dispenser were the best for me as well. You remove the top layer and then the rest of the wipes are available to you ...read morewhen you open the plastic top. No peeling back and replacing a seal every time you want to use a wipe. It is convenient and a product found at a local drugstore. 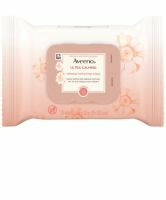 These do take all my makeup off, including eye makeup and they are a pretty good wipe compared to others I have tried. The smell is pretty strong and I think I like Neutrogena's wipes better. They do seem to calm my skin though.